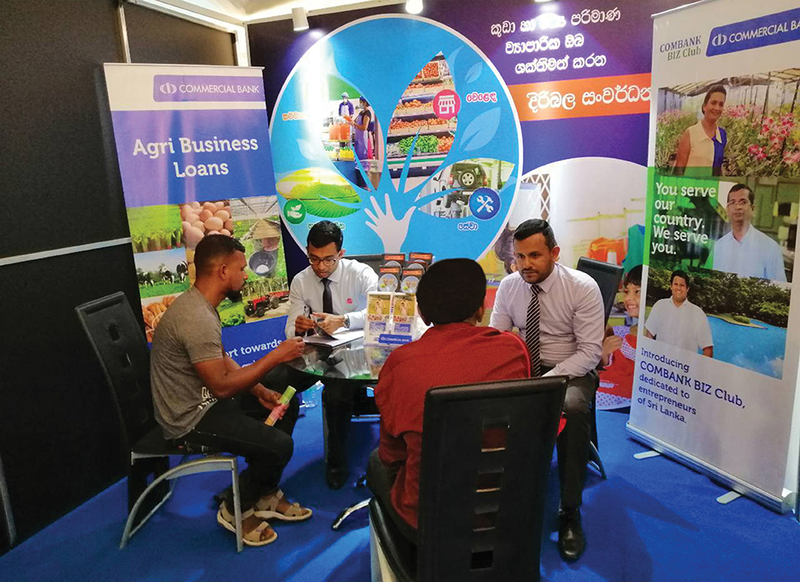 The Commercial Bank of Ceylon has received registrations for a whopping Rs 10 Billion in loans to Small and Medium Enterprises (SMEs), under the government’s ‘Enterprise Sri Lanka’ initiative launched in June this year to stimulate the national economy. The Bank’s concessionary interest loans were disbursed under four designated schemes: ‘Jaya Isura’ for SMEs; ‘Ran Aswenna’ for farmers and those in the agro-processing industry; ‘Govi Navoda’ for entrepreneurs involved in farm mechanisation; and ‘Rivi Bala Savi’ for domestic users to install solar panel units. Notably, Commercial Bank leads all lending banks under the ‘Jaya Isura’ loan scheme, having processed a record 300 ‘Jaya Isura’ loans by mid-August 2018. In total, the Bank has processed over 400 interest-subsidised loans under the four different categories, amounting to a cumulative total of Rs 10 billion. Under Enterprise Sri Lanka, the ‘Jaya Isura’ scheme is applicable to SMEs in agriculture, fisheries, livestock, floriculture, horticulture, light engineering, printing, tourism, handicrafts, apparel, IT, renewable energy and manufacturing industries. The first category under this scheme enables entrepreneurs to borrow between Rs 50 million and Rs 100 million, with a reduced interest rate of 6.75% per annum. Subsequently, category 2 under the scheme offers loans between Rs 200 million and Rs 400 million at a 10.12% interest rate per annum. The ‘Ran Aswenna’ scheme is for small scale farmers, farmer organisations, floriculture and ornamental fish related businesses, agro and fish processing establishments, and commercial scale farmers. Under this scheme, borrowers can obtain loans from Rs 5 million to Rs 750 million according to their respective categories, at an interest rate of 6.75% per annum. ‘Govi Navoda’ is for small scale farmers and farmer organisations, and offers loans of up to Rs 500,000 with an applicable interest rate of 3.38% per annum. The loan scheme facilitating the purchase of solar panels – ‘Rivi Bala Savi’ allows households to borrow up to Rs 350,000 at an interest rate of 6.75% per annum. There are 15 tailor-made local funded and donor funded financial and non-financial schemes under the umbrella of ‘Enterprise Sri Lanka.’The government of Sri Lanka launched this initiative with medium term targets to achieve a per capita income of US$ 5000, create one million new job opportunities, increase exports, and to achieve a continuous GDP growth rate of five percent. Other goals of the initiative include SME development, promotion of green energy, empowerment of the farmer community, and poverty reduction, empowerment of youth, empowerment of women, and promotion of tourism. The only Sri Lankan Bank to be ranked among the world’s top 1000 banks for eight years consecutively, Commercial Bank operates a network of 262 branches and 780ATMs in Sri Lanka. The Bank has won more than 30 international and local awards in 2016 and 2017 and 16 international awards in the first six months of 2018.